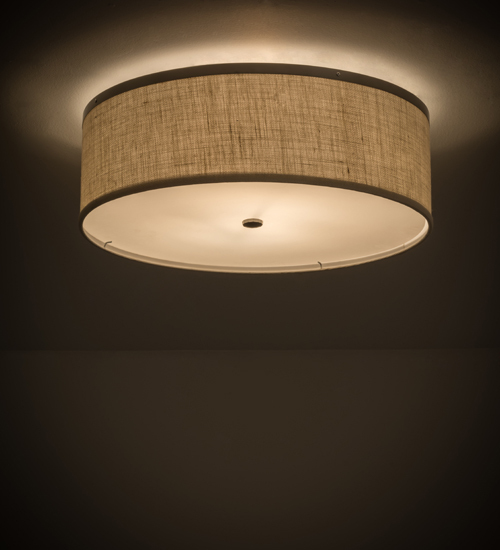 Description: Designed with a clean round profile that fits into the homes and structures of nearly any architectural era, this ceiling fixture defines a distinctive sophisticated aesthetic. The rotund Natural Linen Textrene shade is complemented with a Statuario Idalight bottom diffuser and enhanced with accents a frame featured in a Nickel finish. Energy efficient GU24 compact fluorescent lamps (CFLs) are used for energy savings, reduced maintenance and long lamp life. Handcrafted in the USA, this fixture is available in custom colors, styles and sizes, as well as dimmable energy efficient lamping options. UL and cUL listed for damp and dry locations.